Your house isn’t just a financial investment or the place where you keep your stuff – it’s where you live your life. And moving into a new house can feel a little disorienting at first. It takes awhile to get settled in – there are all sorts of new sounds and smells and sights that can feel foreign for the first few weeks or months. If you’re feeling a little out of sorts in your new place, there are things you can do to get it feeling like home in no time. Here are some of our favorite suggestions. Moving is exhausting – packing and unpacking and a million little details to remember, like when the cable is being set up and making sure you get the mail forwarded. Do yourself a favor and get your beds set up first thing. Even if it means simply having a mattress on the floor – put on your nice sheets, have plenty of pillows and set up a light next to it so you can read a little before drifting off to dreamland. There’s nothing more revitalizing than a good night’s sleep. Another top priority is getting the bathroom set up. This is the room where you begin and end your day, so it’ll set the tone for your mornings and nights. Give it a good scrub, hang up a shower curtain, put out your fluffiest towels and stock plenty of toilet paper and toiletries. Pamper yourself a little with an aromatic candle and bust out the good soaps – you know, the ones you got on your vacation three years ago that you’ve been saving for a special occasion. This is that occasion. Moves can be stressful on your pets, so help them get settled in. Choose a place for their beds and litter boxes and get them on a regular feeding schedule as soon as possible. If you have a dog, take him on a walk and introduce him to the neighborhood. Setting up a morning and evening walking routine will help you both get settled in more quickly. While there is a certain charm to eating pizza off of paper plates for a few nights in a row, your house will feel more like a home when you can prepare a meal there. Go to the market and stock up on fresh foods. Get the coffee maker set up and brew your morning cup at home. If you don’t have your table set up, designate a spot where you eat your meals – like a stack of boxes – and dress it up a little with a pretty cloth and a candle. Unpacking everything can drag on and on, so give yourself a deadline by scheduling a housewarming party. This will motivate you to get settled and get you over that uncomfortable hump more quickly. There’s a reason why people often say “time heals everything” – it really does. 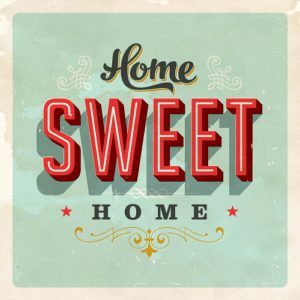 That’s doubly true for making your new house feel like a home. Make it a priority to spend time in your new place reading, cooking and hanging out. Pretty soon, it’ll start to feel like yours.